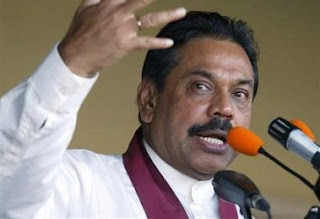 Former President Mahinda Rajapaksa yesterday said nobody had a right to prevent the formation of new political parties. Rajapaksa, addressing the Samurdhi officers at their 19th annual convention at the Samurdhi hall, Battaramulla said that it did not mean that he was planning to form a new party. However, threats and intimidation should not be directed against those who wanted to form new parties. He said the government had become a pawn of the western powers and was bent on privatising state ventures and suspending the development projects launched by the previous administration. "It is also deviating from Bandaranaike policies," he said. The incumbent government had come to power only for a two year period and now they had decided to extend the pact for five years, Rajapaksa said. The former President said "We didn’t fight the Tamils or Muslims. The fight was against the terrorists and we created an environment to live as one nation, one country." The previous government had re-habilitated over 12,500 people and restored the infrastructure destroyed by the 30-year conflict. "We developed the Jaffna Hospital and there are 10 surgical wards on a single floor", he said. The percentage of students entering the Jaffna University had increased and the standard of education in the north had reached a higher level, the former President said. He said the Sirisena-Wickremesinghe alliance had come to power promising a change, but it had failed to deliver. Rajapaksa said even former Presidents J. R. Jayewardene and Ranasinghe Premadasa had also bellowed rhetoric towards the end of their governments. "I have no hatred or anger. The incumbent government should work with more restraint," he said. "It is a right of the working class to strike and it is wrong to assault them," Rajapaksa said.